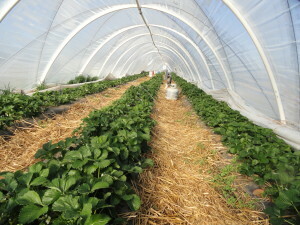 High tunnels are also an integral part of local food production systems in many parts of the United States. They aid fruit and vegetable crop production by extending the cropping season, providing protection from the elements (wind, storms, heat, etc. ), and result in a more-stable production system that poses less risk of crop failure. High tunnels come in many different shapes, sizes, and structures. Many 4-season tunnels are as small as 1000 sq ft for, and 3-season tunnels (plastic is removed during winter) can span ranges up to 20+ acres. This website provides information and links to relevant sites around the world, so that growers and educators have a one-stop source where they can find information on all aspects of high tunnel construction and use. Are High Tunnels for You?